In the night of October the first, our old two masts Aquarellia was anchoring close to the harbour of Porquerolles, one of the three “Provencal golden islands”. At one o’clock in the night I wake me up,… maybe ‘cause of some wave noise? I was surprised by seeing the Orion’s belt stars and M42 rising close to the ‘Sainte Agathe’ fort. With my 7×50 binoculars I sketch this original encounter, the mythic Orion warrior at the rear of a real castle. The French coast, here in my nord, is full of light pollution but to my surprise, the castle illumination was the only light in the sight. 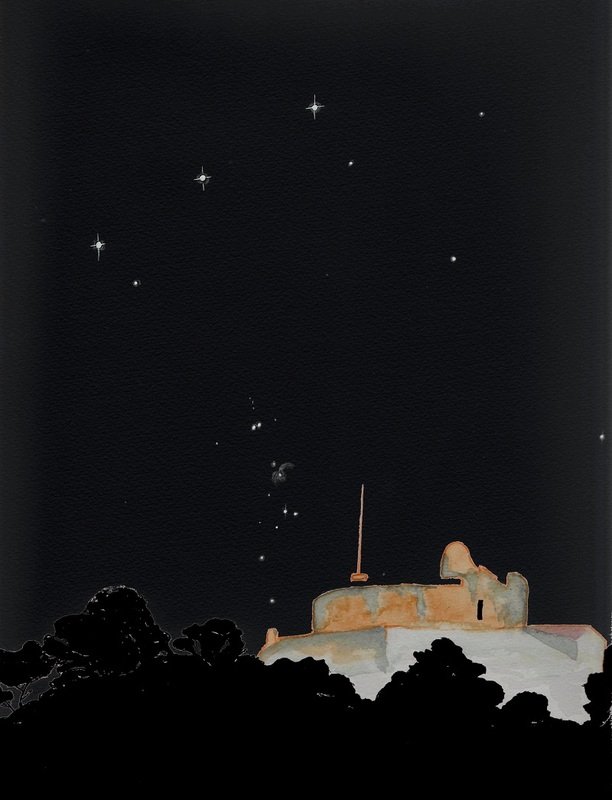 The island is not so close to the polluted coast, so the Orion’s constellation was pure in the dark while rising. Beautiful watercolor with great atmosphere and surroundings.